The Xbox One is already popular with those who enjoy recent-retro gaming - thanks to its backwards compatibility features. 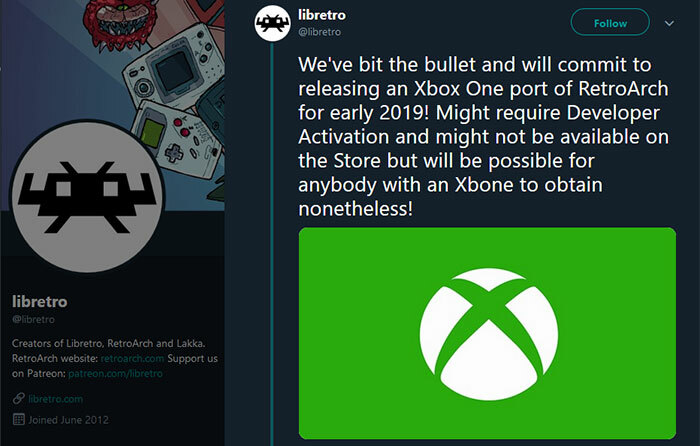 However, the console might be set to become even an more appealing, and wide ranging option, for retro-gamers as the Libretro team have now committed to release an Xbox One port of RetroArch early next year. RetroArch is a popular emulator front end which is used by many on PC, Mac OS, Linux, Android, iOS, the Raspberry Pi, Wii (U), PS3, and even on mini-retro-consoles like the Nintendo SNES Classic to play classic old console and arcade games. The front-end provides an integrated launcher for different emulator cores - to make RetroArch into an (almost) one-stop emulation platform. Microsoft removed various emulator apps from its Store when it updated its content policy, so when RetroArch is ready for Xbox One it might not be as simple as heading over to the Microsoft Store and grabbing the app. However, Microsoft doesn't put huge barriers in place to anyone who wishes to install such software; users can activate Developer Mode on their consoles to allow such apps. Enabling Developer Mode on the Xbox One comes at a cost of US$19 for a developer account. No 'jailbreak' required. Later, if you wish to revert and turn off Developer Mode, your Xbox One will have to be run through a 'factory reset'. While the above might be exciting news for many would-be retro-gamers with Xbox One consoles in their living rooms, Libretro still recommends PCs with their even more powerful CPU and GPU options for the best 3D retro emulation. Now that is pretty cool and a surprisingly reasonable restriction from Microsoft to use it. Only 19 bucks to unlock the capability for it. It does make me curious why the lockout is there, maybe a debug mode and kernel access? I've just built a Retropie full-size Arcade cabinet which has been great but isn't the best at some of the newer N64 games etc. My next thought is a hyper spin setup, but this be the start of interesting times for XBOX One in the emulation scene, especially as many will be retired in the new few years for whatever comes next. Have you tried looking at Rock 64? It's much more powerful than the Pi.